From the Southwest Region, Julia Lynn-Elias, DVM, and from the Northeast Region, Nick Kohut, DVM, and Patti Stedman, will be sworn in as new AERC Regional Directors at the 2012 AERC convention. Representing the Mountain region will be Susan Shomburg and Jan Stevens; in the West, Maryben Stover and Forrest Tancer; Roger Taylor will continue as the Southwest Region's other regional director. All other incumbent regional directors will be continuing on for the next two-year term. December 18, 2011~The Goeth Challenge Endurance Ride, the last FEI ride of 2011, was also the first ride of the 2012 United States Equestrian Federation year. Held at the Goethe State Forest west of Ocala, Florida, the December 17 competition included 80,120 & 160k divisions. Many endurance trainers from the cold north are taking their winter barns to this area to condition and compete in the temperate Florida climate. On a day that saw temperatures at 75F (24C), 21 horse/riders took the trail in the 160K, 9 riding in the FEI Division. Ride Camp was located at the nearby Black Prong Equestrian Center. Taking a break from her training position in Qatar, Ellen Olson took home the winning time and Best Condition on the Shagya, SA Belshazzar (Bayram x Jay El Tongafarah ox), in the 160 CEI3* with a ride time of 9:33 and an average speed of 16.80kph. “Zar had a fantastic day,” said Olson. “This year he is the strongest yet of his career. We were near the front all day. Darolyn Butler and Valary Kanavy were in front positions as well. The trail was deep sand and very concussive road. There was actually a big turnout for each distance, over 100 riders for a one day ride..."
Tell us about your horse. When/how did you come to get him/her? Chief was given to me by his breeder. He thought I would be a good match for him; he wanted Chief to ‘do something’. I told several of my friends about these horses in the bay area that the owner wanted to find good homes for. Nobody else was interested, I think everybody thought a ‘free’ horse meant something was wrong with it. That couldn’t have been further from the truth! I took Chief home, dropping him off at the vet clinic on the way where they gelded him the next morning. Chief was almost 6 years old at the time. What is your horses breeding? Classical Spanish and CMK, Arabian. Why did you decide to purchase this horse (or if you didn’t purchase, why did you choose to use this horse in endurance)? I liked how this horse was put together. He had nice feet and a good disposition too. You’d never have known he was gelded so late as he was always well mannered. He had not been started yet so I was starting with a clean slate on a horse already old enough to start steady work. Did you do endurance with any other horses before this horse? Yes, Dream Weaver and Rocky. Chief is my third endurance horse, and I’m the only one that has ridden him in an endurance ride. How many different horses have you ridden in this sport? A total of six. Do you participate in any other horse sports or activities? Not so much any more. I used to show and do a lot of play days, plus trail riding. How many years have you been involved with horses? In endurance? I had horses as a kid, then went twenty years without. I got started in endurance riding in 1994. What got you interested in endurance riding? What was it that kept you interested? I wanted to do the Tevis. It’s close to where I live, and I heard a lot of stories about it. I went camping with friends to Robie Park and was mesmerized by the stories from endurance riders who were there. It took me three years to finally reach that goal, and in the meantime I realized that it wasn’t so much the destination as the journey that was the best part. I was having a great time. Ellen Rapp and SA Belshazzar took 1st pace and Best Condition at the Goethe FEI 100-mile ride in Levy County, Florida on December 17, 2011. Finishing time was 9 hours 30 minutes. SAN FRANCISCO, Dec. 18, 2011 /PRNewswire via COMTEX/ -- The partners at Hellman & Friedman announce with great sadness today the passing of our Founder Warren Hellman, 77, due to complications associated with leukemia. "Warren was a great mentor, partner and friend, and above all, a great man," said Brian Powers, Chairman of Hellman & Friedman. "He will be deeply missed. His commitment to civic and philanthropic activities and his extraordinary generosity to the many causes he supported will have a lasting impact on our community." "We have been blessed with an amazing founder. Warren has been an inspiration to all of us and set the standard by which we strive to live our personal and professional lives," said Philip Hammarskjold, Chief Executive Officer. "Warren taught us not only to be better investors, but to be better people. He always set his own course and did things in his own way. He wanted to build an investment firm dedicated to serving its limited partners and the businesses in which we invest. We have all benefited greatly from his vision, generosity and leadership." Mick Hellman, one of Warren's four children said on behalf of his family, "Dad believed in people and their power to accomplish incredible things. In that vein, he helped start several really successful businesses over the years, and he considered Hellman & Friedman his highest professional achievement. He was an incredible problem-solver, and was great at bringing groups together that had naturally opposing interests and nudging them to a solution. He was particularly passionate about the people of San Francisco, and succeeded at projects that seemed like lost causes: fundraising for an underground parking garage in Golden Gate Park and building a consensus for pension reform in San Francisco. But he always pushed himself the hardest. His learning to play the banjo is a great example of Dad's determination and ability to find joy in confronting a challenge and overcoming it. He actually became a pretty good banjo player, and it was always really cool to walk into a limited partners meeting at Hellman & Friedman and hear his band performing." Emmylou Harris, 12-time Grammy winner said, "I first met Warren through our mutual love of bluegrass music and came to realize over the years what a special person he was. He gave so much of himself to so many and we are all the richer for it. I'm blessed to have known him and call him my friend." Mr. Hellman was a pioneer in the private equity business. After a distinguished career on Wall Street, he co-founded Hellman & Friedman in 1984 with Tully Friedman, and built it into one of the industry's leading private equity firms. Since its inception, the firm has raised over $25 billion of committed capital and has generated some of the industry's most outstanding investment results. Mr. Hellman was critical in many of the firms investments, including Levi Strauss & Company, VoiceStream Wireless, Young & Rubicam, Eller Media and The NASDAQ Stock Market. Mr. Hellman joined Lehman Brothers in 1959 after graduating from Harvard Business School, and went on to become, at age 26, the youngest partner in the firm's history. From 1962 to 1977 he served in various capacities at the firm culminating in becoming its President in 1973 at age 39. In 1977, he left Lehman and moved to Boston to co-found one of the early firms in the venture capital industry which subsequently became Matrix Partners and remains a leading venture firm today. During his tenure, Matrix was an early investor in such notable start-ups as Apollo Computer, Stratus Computer, Continental Cable (now Comcast), and Apple Computer. Also in Boston, Mr. Hellman co-founded Hellman, Jordan Management Company, a specialty equity investment manager. Mr. Hellman was a noted philanthropist with strong roots in a wide variety of local causes. He was an active participant within the community and gave generously of his time and experience to make a difference. His extraordinary generosity touched the lives of many. Mr. Hellman served as a past Chairman and Trustee Emeritus of The San Francisco Foundation and was a well-known contributor to St. Anthony's Foundation, Golden Gate Park and the San Francisco Free Clinic, which was founded by his daughter and son-in-law, Drs. Tricia and Richard Gibbs. He was an avid proponent of public education and was a proud public school graduate himself. When he was Chair of the San Francisco Foundation, he convened the San Francisco School Alliance bringing the business community and funders to support and partner with the San Francisco Unified School District. He served as a member of the Advisory Board of the Walter A. Haas School of Business at UC Berkeley and Trustee of the UC Berkeley Foundation. Mr. Hellman was also a contributor to the UC Berkeley aquatics program where he helped endow the Men's Water Polo Program, and instituted the Hellman Fellows Program at the University of California. In addition to serving the community at large, Mr. Hellman was also a member of the Board of Directors & Executive Committee for the Jewish Community Federation and Chair of the Jewish Community Endowment Fund. He was Founder and Chairman of the Board of The Bay Citizen, a non-profit local news organization, and a Trustee Emeritus of the Brookings Institution. Mr. Hellman had a deep love of music, none more than bluegrass, the appreciation of which he always said was "hard-wired". Later in his life, he became an accomplished 5-string banjo player, and had an old-time band called The Wronglers with whom he performed all over the U.S. The Wronglers collaborated with country singer Jimmie Dale Gilmore this year and released the CD "Heirloom Music"; in June, they made a guest appearance on A Prairie Home Companion. Mr. Hellman was the Founder and principal sponsor of Hardly Strictly Bluegrass in Golden Gate Park, San Francisco--an annual three-day, free music festival which brings together over 90 leading and emerging music groups and draws over 750,000 attendees each year. Speedway Meadow, the site of the Hardly Strictly Bluegrass festival, was recently renamed "Hellman's Hollow" in honor of Mr. Hellman. In 2005, he was inducted into the American Academy of Arts and Sciences. Mr. Hellman and his wife Chris, a former dancer, were generous supporters of the arts, including the San Francisco Ballet, where Chris chaired the Board for many years and helped make the San Francisco Ballet one of the leading ballet companies in the world today. Mr. Hellman also supported San Francisco's ODC contemporary dance company and served as Chairman of Voice of Dance. Mr. Hellman played an active role in civic affairs in San Francisco and California. Dedicated to the well-being of San Francisco citizens, he served as a board member of the Committee on JOBS, the San Francisco Chamber of Commerce and Bay Area Council. Most recently, he was a pivotal member in organizing support behind Proposition C, legislation aimed at reforming San Francisco's pension system. He fostered collaborative efforts among the various constituencies to reach a joint solution. He was not afraid of political controversy, however, and led and provided financial leadership to the critical and successful effort to build an underground parking structure in Golden Gate Park, helping to keep the California Academy of Sciences and the de Young Museum in their historic locations. The 2012 Adequan® AERC Championship ride will be held at the Biltmore Estate in Asheville, NC, on September 20 (100 mile championship) and September 22 (50 mile championship). More information to follow! Virginia Beach marks end of horse trip across U.S. In the lethal heat of the Nevada desert, locals left them buckets of water. When one horse went lame in Colorado, a stranger gave them a spare. The dog began following them Kansas - a stray who had no idea what she was signing up for. After 4,000 miles, 10 states and 21 months in the saddle, Richard and Jeannette McGrath are riding through Hampton Roads on the last leg of a coast-to-coast trail ride. As of this morning, they're just 10 miles from the final "whoa" - planned for Saturday around 1 p.m. - when their horses will sink their hooves into the saltwater off Virginia Beach. "We're exhausted," Richard said. "All of us. Everything hurts..."
After years of horse racing, Steven Hay now can call himself a world-class equestrian. Hay, a 21-year-old Halfmoon Township resident and Penn State junior, is traveling to United Arab Emirates to represent his country in the Young Rider World Endurance Championships on Saturday in Abu Dhabi. As part of the five-member U.S. team, Hay will vie with riders from 35 countries on a 75-mile desert course. The sandy conditions will be new, but the distance will not. Hay, ranked second in the country for ages 14 to 21, has excelled in endurance races for nine years on trails up to 100 miles long. He prefers hours in the saddle, going from one rest station to the next, to the horse shows of his earlier youth. The team represents some of the United States' most experienced Young Riders aboard horses who have tracked many miles at the top levels of the sport. This summer four of the five riders experienced international championship competition for the first time at the Adequan/FEI North American Junior & Young Rider Championships presented by Gotham North (NAJYRC) where they also gained valuable team experience. Riding for Team USA, Russell captured the Team and Individual CEI4* Championship Gold Medals. She will ride Gold Raven, who has won nearly every CEI she's contested. Aiding in capturing that NAJYRC Team Gold was Gibbon, who also took the Individual Bronze with Misu Koran. In the non-championship CEI2* division, Hay and Khalil Asam took home a Team Gold and Individual Bronze, while Clark and DA Al Capone helped USA Southeast take the Team Silver. As the 2010 USEF Junior Equestrian of the Year, Kimbler will also bring a depth of skill to the team. She has competed and medaled at several non-championship NAJYRC events in addition to multiple top five placings at CEIYJs. "Words cannot express how very lucky and fortunate I feel to have reached this level to represent the United States," said Gibbon. "I am no less than thrilled to partake in this event on such a wonderful horse, all thanks to Misu Koran's owners Steve and Dinah Rojek." The team will be led by Chef d'Equipe Emmett Ross, "As Chef d'Equipe of the U.S. Young Riders I am really looking forward to working with five very strong horse/rider combinations," said Ross. "These Young Riders will hopefully become candidates for our senior teams in World Endurance Championships. The U.S. development of Young Riders has been a huge focus and effort by several people including Jan Stevens and Kathy Brunjes, their efforts have produced these five strong riders as well as many others. As chef I have a goal of finishing all riders in a competitive environment with a chance of sneaking onto the podium. It will be a strategic race over the 75 mile course." Ross will be joined by Team Vet Dr. Dwight Hooton, both of whom have significant experience working in the UAE. Three of four team riders will need to complete the course to post a team score (aggregate total time of three riders score as a team). All riders will compete as individuals as well. There will be five vet checks throughout the race to check the horse's soundness and metabolic capacity in order to be allowed to continue, these checks are part of FEI's significant guidelines for the Welfare of the Horse. 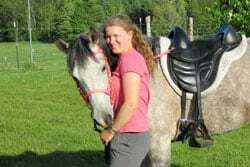 EAU CLAIRE (Press Release) - A University of Wisconsin-Eau Claire senior's essay that details her struggles and triumphs in equestrian endeavors was accepted for publication by a national horse magazine. Any essay by Larissa Sprecher, a creative writing major from Cadott, was accepted for publication by the equestrian magazine Equus. The essay, "Worth the fight," is about the many struggles Sprecher has experienced with her Arabian mare, Cheeks. "I bought and trained her in hopes that she would be my new endurance horse, but she had several severe, debilitating hoof conditions and injuries, one after another, that literally left her barely able to walk," Sprecher said. Endurance rides are long-distance horse riding competitions, where participants can cover up to 100 miles in one day. Sprecher said she grew up riding horses and has competed in endurance riding for six years. Through Sprecher's determination and hard work, Cheeks went from being crippled almost a year ago to logging more than 500 competition miles this past season. "I don't mean to make it sound cheesy, but it is basically the story of a miracle," Sprecher said of her essay. Steven Hay is the latest world-class equestrian to be sponsored by Kentucky Equine Research (KER). He was recently chosen to represent the United States at the Young Rider World Endurance Championships, to be held in Abu Dhabi, United Arab Emirates, on December 10, 2011. Hay will ride Khalil Asam in the competition, and he feels honored to do so. "I'm blessed to have the opportunity to compete with this horse against the best young riders in the world. He is one of the most phenomenal horses I have come across. Not only are his athletic abilities most impressive, but his personality fills the barn," said Hay. Khalil Asam is owned by Natalie Muzzio. Hay will use Kentucky Equine Research (KER) products in preparation for the international event, including Preserve™, Nano-E®, RiteTrac™, and KER-Flex®. You can support Hay and his bid for gold by ordering research-proven supplements from KER. Whether you order online or talk to a customer service representative at 888-873-1988, use discount code SAMMY and receive 10% off your total order. A 10% donation on all products sold using the Champion Code SAMMY will then be passed on to Hay to help defray competition expenses to Abu Dhabi. This discount code will be valid until February 10, 2012. Hay has an impressive competition record including individual and team medals at the 2010 and 2011 North American Junior Young Riders Championships, and multiple other top finishes at prestigious endurance events. He began riding in endurance competitions at the age of 12 and has accumulated over 2,800 miles, many of which were ridden on horses he owns and conditions. Aside from his equestrian interests, Hay is a full-time student at Penn State University, where is pursuing a degree in environmental resource management. Canada's Year-End Endurance Standings have been announced. 2011 America's Favorite Equestrians - and the winners are . . .
WESTPORT, CT - Jenny Belknap Kees, Chairman of the Board of The EQUUS Foundation and John Long, President of the United States Equestrian Federation, announced "America's Favorite Equestrians" for 2011representing the disciplines of Driving, Dressage, Endurance, Eventing, Jumping, Para-Dressage, Reining and Vaulting at their Victory Celebration on Friday, November 4, 2011, at the Alltech National Horse Show in Lexington, Kentucky. The program was established by the two organizations to recognize the heroes in our equestrian sport and to build grass roots support within the equestrian community for the many worthy causes supported by The EQUUS Foundation on behalf of horse welfare and the people who benefit from the horse's unique ability to empower, teach and heal. "One of the best actions we have taken in recent years is to partner with The EQUUS Foundation," said John Long. "We look forward to continuing to build our relationship in the future." "We are very grateful to the thousands of equestrians who cast their votes with their $5 donations to The EQUUS Foundation," said Jenny Belknap Kees. America's Favorite Equestrians were selected based on the athletes with the highest number of votes recorded in each of the eight disciplines on October 31, 2011. The inaugural 2011 program celebrated the eight international disciplines represented on the field of play at the 2010 Alltech FEI World Equestrian Games, with the equestrians selected by the respective affiliates of the United States Equestrian Federation. The goal is for America's Favorite Equestrian to be an ongoing program with all equestrian disciplines and breeds represented and the winners recognized in a permanent Hall of Fame. "It is our great pleasure to be able to announce the results at the Alltech National Horse Show," continued Belknap Kees, "and to support these disciplines with a $10,000 donation to the United States Equestrian Federation." And, the winners for 2011 are . . .
About The EQUUS Foundation, Inc. The EQUUS Foundation, Inc., established in August 2002, as a 501(c)(3) national charitable foundation, is dedicated to improving the quality of life of horses, promoting the use of horses to enrich the lives of those in need, and educating the public about the horse's unique ability to empower, teach and heal. Thanks to the generosity of its donors, The EQUUS Foundation helps thousands of people and horses each year. Donations are tax-deductible to the full extent of the law. Contact The EQUUS Foundation, Inc., at 168 Long Lots Road, Westport, CT 06880, Tele: (203) 259-1550, E-Mail: equus@equusfoundation.org, website: www.equusfoundation.org. BOISE -- Veterans Day. It is a day to honor those who have served our country in the military. But this year, a new report reveals shocking statistics about our all volunteer force. From 2005 to 2010, military service members took their own lives at a rate of one every 36 hours. The Department of Veterans Affairs estimates 18 veterans die by suicide every day. To fight this tragic trend as more troops return home in the coming weeks, screening is being done to check for risk factors like posttraumatic stress disorder. Treatment options are increasing too. Veterans need to know that research and experience are proving that new methods to treat PTSD are very effective and sometimes unconventional. An equine specialist in eastern Idaho has known that for years. She has been giving her time and her horses to veterans since 2007, discovering with them, the power of healing on horseback. At Tranquil Valley Sanctuary, near Malad City in eastern Idaho, it is a brand new start for veterans with severe PTSD. Donna Thibedeau's 21 horses are mostly rescues and that is how she describes the veterans who find their way here, "They fought for us, they gave up their life and their quality of life for us and we need to fight for them when they come home." Joyce Sousa of Hydesville riding her Arabian horse LV Integrity rode to a first place finish at the Ride Bear 50 mile endurance race in Gilroy on Oct. 2 and then returned to Silver Springs, Nevada on Oct. 15 at the High Desert 50 mile race and placed first against 39 other riders in a time of 5 hours and 29 minutes. LV Integrity also was judged to receive the Best Condition award. The following day, the pair raced to a 3rd place finish in the 50 mile competition. LV Integrity in June raced his 31st 100 mile ride in Oregon and placed 2nd. There will be about 30 animals available for adoption—several burros, mares, geldings and yearlings. The animals are wild, and were taken from herds that roam ten western states. Wild horses and burros are protected in America, but the herds are growing out of control. To avoid environmental destruction, the federal Bureau of Land Management routinely moves the animals to holding facilities to await adoption. The wild horses and burros in these facilities—41,000—now outnumber the more than 38,000 roaming wild. Tom Gorey is a spokesman for the Bureau of Land Management. Gorey says though the animals are wild, they can be trained. “People who adopt a mustang generally have a very good experience. They recognize that the horse is intelligent, sure-footed and has good endurance capacities,” he said. Prospective owners need to have an appropriate place to keep a horse, and demonstrate knowledge of the time and money needed to care for the animal. The animals aren’t domesticated, so prospective owners also need to realize the work associated with training a horse. The adoption fee is $125. The animals can be previewed today from 2 to 7 pm. The adoption is first come, first served on Saturday. Twenty–four year old Luke Nowlin set out on June 8 from Emerald, North Carolina, to cross the country to Eureka, on the Northern California coast, on horseback. He arrived at the Chadeau Mountain Clydesdale Ranch in Tehachapi the afternoon of Thursday, Oct. 27. That’s how Nowlin ended up in Tehachapi at the Chadeau Mountain Ranch. Nowlin depends on the kindness of others for shelter for himself and his horse. He's fully prepared to sleep outdoors, on the ground with the sky for a roof if he has to, but he's only had to do that on few occasions. Some nights he stayed with people who were living in trailer houses, the floor was rotted out they didn’t have anything to eat because it was the 28th of the month and food stamps don’t come till the 30th. The rest he's spent in the guest bedrooms in strangers' homes or in barns and he even spent a few days at the Biltmore Mansion in Asheville, North Carolina. Of all the trails advocacy organizations in the United States, Back Country Horsemen of America has become one of the largest contributors of volunteer service. In 2010, they gave 345,000 hours of volunteer service with a value of over $7,500,000. Considering today’s economy, that’s quite an accomplishment. What exactly do Back Country Horsemen do during all those volunteer hours? From clearing trails and hauling gravel for improving campsites, teaching folks responsible recreation habits and how to pack, improving water crossings and building camping facilities, there’s plenty to get done. BCH people even do some things you’ve probably never thought of! Back Country Horsemen are always eager to show how useful pack stock can be, especially in remote and protected areas where motorized vehicles are impracticable or would damage a delicate ecosystem. The Cherokee National Forest in Tennessee is reestablishing the Southern Brook Trout Hatchery at Pheasant Fields in the Tellico Ranger District. The rebirth of the hatchery is part of a larger brook trout restoration program that has the support and the horsepower of the Southern Appalachian Back Country Horsemen behind it. Appalachian Back Country Horsemen, Tennessee Wildlife Resources Agency, Trout Unlimited and Southern Appalachian Wilderness Stewards came together to conduct a trial run of one important element of the Brook Trout Restoration Program: transportation. The test was a big success. Using pack stock provided by members of Southern Appalachian Back Country Horsemen, 140 rainbow trout were moved two miles with a 100% survival rate for the fish. This test was critical to determine the viability of using horses and mules for transportation, as many of the habitats and locations for restoration are isolated or in federally designated Wilderness Areas. In the future, pack stock will be used to transport brook trout from existing population centers to the reopened Fish Hatchery just before spawn. The offspring of this breeding cycle will become the foundation of future population restoration efforts. Back Country Horsemen members will be called back into action when the time comes to transport these offspring to their new habitats, returning native brook trout to their historic rivers and tributaries. Head injuries account for approximately 60 percent of deaths resulting from equestrian accidents. Because horse racing organizations require approved helmets, jockeys now suffer fewer head injuries than pleasure riders. Despite those facts, some people remain averse to wearing helmets when riding, especially those who ride western. Wyoming Back Country Horsemen put a priority on changing that. WBCH volunteered their time to raise the funding to buy fifty helmets in various sizes to create a “lending library” of helmets. People will be able to check out one or more helmets when they need one for a short time, such as when members have visiting children who want to ride. Wyoming Back Country Horsemen especially targeted young people, hoping that the helmet-wearing habit will continue into adulthood. In addition to the helmets, they volunteered their time to acquire funding for professionally made safety posters aimed at horsemen. Young Cloud Peak BCH member Mariah McFaul modeled for the safety poster. She posed with her horse putting on her helmet and as a wounded horsewoman. The posters will be displayed in schools, hospitals, and other appropriate places. Each year, volunteers from the Gila Chapter of Back Country Horsemen of New Mexico clear many miles of forest trails to keep trails open to equestrians and other recreational users. Over the last four years, the Gila Chapter has cleared over 260 miles of trails. Even though the snow caused them a late start, they still cleared 50 miles of trails in 2010. GBCH trail work has taken place primarily in the Silver City District and the Wilderness District of the Gila National Forest. Trails cleared have included parts of the Continental Divide Trail, trails along the Mimbres River in the Aldo Leopold Wilderness and several other popular recreation trails. To accomplish this work, they put in 777 accident-free volunteer hours and 119 stock use days. In 2010 their most ambitious project was opening trails along the Mimbres River. From June 30 to May 3, volunteers camped at the Mimbres River Trailhead and cleared the first seven miles of the main trail. Weather added to the challenges; on May 2, they rode out in a snowstorm. By the time it stopped, there were four inches of snow on the ground. The second project to clear Mimbres River Trails took place May 7-13. GBCH volunteers along with the Wilderness District Trail Foreman packed in 600 pounds of horse feed for the upcoming work. They then rode horses and packed camp equipment and food into the camp spot near the forks of the Mimbres River. On May 9, clearing work began. The group worked on the lower portion of the Middle Fork Trail and the South Fork Trail for the next four days. By the time the group packed out to go home on the 13th, over 100 trees had been cut with crosscut saws or moved from the trails and another four miles were clear. This trail had not been cleared in over four years, so downed trees had entirely blocked the trail. The efforts of the Gila Chapter of Back Country Horsemen of New Mexico resulted in the completion of the South Fork Mimbres River Trail and completion of the North Fork Mimbres River Trail (an additional seven miles). Obviously, BCHA folks understand the value of hard work. Protecting our right to ride isn’t just a philosophy; it’s a responsibility that requires action in a variety of forms. Back Country Horsemen of America is proud to live up to that and get the job done. Most equine veterinarians, at least those who are American Association of Equine Practitioners members, work with nonracing performance horses during their years of training and competition. These animals compete in a wide range of athletic activities encompassing everything from rodeo to dressage to endurance riding. To better assist its members, the AAEP has developed guidelines for veterinarians who treat horses competing in athletic events other than racing. The document, "Clinical Guidelines for Veterinarians Treating the Non-Racing Performance Horse," promotes medical practices the AAEP believes place the appropriate emphasis on the health, safety, and welfare of performance horses. Focusing on the highly competitive performance horse environment, the guidelines address the importance of obtaining a specific diagnosis before administering treatment. "The current use of medications to manage competition horses is often permissive and excessive. This environment is propagated by owners, trainers, and veterinarians who fail to appreciate the potential harm to the horse inherent in the excessive or frivolous use of multiple medications and supplements in the quest for competitive success," according to the guidelines. All medical treatment of performance horses should be based on a veterinary diagnosis with appropriate time allowed for an evaluation following treatment to ensure the horse has recovered before it competes again, the guidelines go on to say. Administering joint injections without a specific medical indication is listed as an example of underdiagnosis and overtreatment. The competition schedule should not be the primary factor when evaluating a horse's need for medical care, the guidelines contend. In addition to medication administration, the document addresses the use of shockwave therapy, acupuncture, chiropractic, and cold therapy. Also included are recommendations for veterinary medical records, drug compounding, and infectious disease control at competitions and sales. The guidelines will be updated as research provides new data about the medical care of performance horses. The clinical guidelines were developed by the AAEP Task Force on Medication in the Non-Racing Performance Horse, a group composed of private and regulatory veterinarians involved in a wide range of sport horse disciplines. Dr. Nathaniel A. White II, AAEP immediate past president, served as task force chair. "While the guidelines were written for veterinarians, we hope our recommendations will resonate with owners, trainers, and organizations involved with competitions," explained Dr. White in a Sept. 19 AAEP press release. "Everyone involved in the care of the horse must appreciate the potential harm that may come from the excessive use of multiple medications. Simply giving a horse time off from competition is often the best medical choice that can be made." The clinical guidelines are at www.aaep.org/white_papers.htm . After working with her Arabian gelding for about five years, Pocatello’s Laura Yost saw the opportunity for her horse to “open up,” earning ninth place in a nationally esteemed endurance race. Yost, 36, competed with her horse, O.T. El Din RSI, in the Tevis Cup or Western States Trail Ride on Oct. 8. The race is 100 miles across the Sierra Nevada Mountains from Truckee, Nev., to Auburn, Calif., fluctuating in elevation from 8,700 feet to 700 feet. ROUND MOUNTAIN — Toodles doesn't look like a long-distance runner. She's sturdier and more stout than most marathoners. But this four-legged endurance athlete — a Polish Arabian mare — has plenty in common with her human counterparts. She spends months building endurance. She tapers, easing off on training in the days before an event. And her owner carefully monitors her nutrition on game day, giving her electrolyte paste and the equine equivalent of energy bars to keep her from bonking. "It's just like a human athlete," says Elaine Swiss, a retired high-tech executive and Toodles' owner and partner in competitive trail riding, one of two types of long-distance riding events popular in Central Texas. At competitions, Swiss and Toodles follow a marked trail, tackling obstacles along the way. Judges lurk in bushes, scoring each horse-rider team as they pass through gates, scamper up and down steep hills, cross streams and negotiate special tasks. Teams must finish within a designated time window, but the first team across the finish line doesn't necessarily win. Endurance races, the other type of long-distance riding event, are pure races. The winning horse is the first to cross the finish line. Heraldic and John Crandell are in Chile preparing for the 2011 Pan American Endurance Championships on October 22, 2011. This is Part II of a story about Heraldic, written by Crandell. My heart sank that day in August of 2008. Heraldic was in training for the 2008 FEI World Endurance Championship in Malaysia, and only a few weeks from departing to a training camp in Florida. He had been moved to a smaller meadow the evening before and was slated for shoeing in the morning. As I approached to bring him in, I realized something was terribly wrong. Heraldic looked both ways, contemplating evasion as always, but never moved. Getting closer I could see his left hind leg was bloodied from a 2.5 inch diameter open wound medial on the stifle; Grade 5 lame. I hobbled Heraldic 50 yards to a nearby shed for treatment. Dr. Jeannie Waldron rushed over and we begin what I already knew would be a long ordeal. There was little need for sonograms to visualize the critical tissues around the stifle; we could see it all with the naked eye. The collateral ligaments were visibly bruised but intact, and we saw no evidence that the integrity of the joint capsules critical infection barrier had been compromised. By extremely narrow margins, we were spared these aspects of athletic career ending injury, but there were still huge uncertainties that threatened not just his athletic ability, but his life itself. Dr. Waldron thoroughly cleaned stones and debris out a nine inch deep pocket of loosened skin extending below the stifle, and installed drain tubes to allow the wound to expel fluid as it healed from the inside out. We anticipated that we would have a critical recovery period in a the next weeks as the bruised ligamentation around the joint went through an even more fragile stage in the early phases of healing, so the same shelter just yards from his injury was prepared to be the site of a long convalescence; as fully immobilized as a horse can survive. The Barbaro tragedy demonstrated to the world how difficult it can be to survive a horse through an extended period with a non-weight bearing limb. It is the opposing sound limb that must bear the load of the horses’ weight without a moment’s relief that is prone to the most irreversible demise. We were fortunate that Heraldic seem comfortable to face down-slope in his shed stall, providing some physical load relief to the overburdened hind limb. We selected bedding that would fill the concavity of his hoof for the most diffused support possible. Now there were weeks of careful monitoring, and wound nursing, and hoping ahead. It was more than a month before Heraldic could bear weight for even a moment on the left hind leg. It would be several more months before Heraldic would walk freely in a paddock. His entire left hind quarter was completely atrophied, which stood in stark contrast to the muscular right. The wound itself had healed as flawlessly as we could have ever hoped, but the road back to the athletic wonder that Heraldic had been before would be a very long one. It was like starting his endurance racing development all over again, with additional attention needed on rebalancing. We will never know exactly what caused the accident, which was probably just a high speed fall and skid on the abrasive soils in the mountain meadow. Something must have startled him for such a violent wipe-out, but those reasons why are lost in the dark of that night in August. Starting all over again has not been without some benefits. My extended family is always improving our training processes, and raising the standards of education we expect of our horses as they advance in a physical fitness program. Every endurance trainer struggles between the investment of time toward more refined training standards, and the rigors of a fitness program. With more effective training techniques we are able to set higher standards early, which leads to better efficiency later in the program. This integration is pivotal to raising the ceiling of performance. It’s not just about grinding workouts; it’s about working hard without sacrificing precision. It’s about eloquent sweat. After a year and half invested in the therapy and retraining, Heraldic came out of the ordeal re-educated, more disciplined, and better prepared to train for fitness than ever. The 2010 Old Dominion 100 was the first ride we attempted after his two year absence from the endurance scene. Just as in developing a new endurance horse, his fitness program to this time had favored certainty that his soundness durability had been fully developed. He was still not at peak physical performance, but like the Tevis, the Old Dominion tests fitness and a lot more. Heraldic at 90% fitness is still not shabby, and the Old Dominion is our home turf (rock and sauna). We were first place and BC by a modest margin. Two weeks of rest after Old Dominion and then several cardio/muscular focused workouts had us physically right where I felt we needed to be for Tevis. Greyson had been on a similar work schedule all season, and was performing flawlessly, so he was the clear choice for an alternate. It takes a lot of investment of time and logistics to prepare for the Tevis from out of the region. It’s both practical and fairest to the horses not to put all that pressure on one horse. To have Shannon Constanti ride Greyson, was a late opportunity offered by Linda Glaiser, who with Roger Yohe had been a trusted friend and gracious host in our Tevis adventures for several years. Heraldic is strong and focused to the end with or without company, so we had always performed in quiet solitary for most of our endurance races. I estimated that the rider weight difference between us would be a just enough of offset the very slight difference in the ability of the two horses, and that they would be very well matched together. I was determined to ride each horse to its own best advantage, but new that we just might be able to stay together all day. I realized as I woke the morning of the Tevis that the high altitude temperature was freakishly warm. I knew that we were as well prepared for heat as anyone could be, so it only bolstered my confidence. The “new” Heraldic gave me the calmest, most disciplined start ever, so we warmed up and moved out with excellent early efficiency. I never have as much concern about the competitive racing aspect of the challenge as most people would think. To me the day is simply an opportunity for a nature based test of training theories and techniques, and other riders in the field are simply providing welcomed additional benchmarks. I was a little concerned that I might be over-pacing when we pulled into Red Star Ridge only a few moments behind the leaders, but the horses pulsed faster than I could take a wiz, and we were on our way. Heraldic and John Crandell are in Chile preparing for the 2011 Pan American Endurance Championships on October 22, 2011. This is Part I of a story about Heraldic, written by Crandell. We had driven many hours to pick up a young horse that was been donated to the Old Dominion Rides for a fund-raising raffle. As we walked out into the meadows and mucky winter barnyards in Sink Hole, West Virginia we saw a scene that seized our attention like one wild horse watching another come over the horizon. There were forty or so horses in one group, excited by the appearance of strange humans in a field and charging back and forth in front of us. There in the middle of the herd was one of the most striking movers we had ever witnessed. It was evident that he wanted to hide himself more in the middle of the group as much as he could, but he couldn’t seem to avoid outpacing all his companions. With an effortless, floating motion he would propel himself from the back to the front, just as the herd was doing an about face, placing him in the back again, and repeating the cycle. This was Asgard Arabians, and there was not a shabby mover in the lot. If any of the other horses were placed in a more common group, they would have stood out just as clearly. Here we knew we were witnessing something that was an astounding exception, something that was distinct even among the very best. My father was absolutely smitten. Stood still, he wasn’t particularly more striking than some of the other great specimens in the lot. Identifiable by a distinctive and complex blaze, and one white eye, but coloration means little to us. He had good proportions, as best as can be discerned in a two year old, with muscles flowing well down his limbs. Well formed joints. He had a particularly generous separation of tendon and bone through the cannons. There was an overall image of great strength, without being the slightest over-built… design eloquence. Truthfully, there were a lot of horses there that fit that description, and many of them have gone on to become renowned endurance horses, but when we saw this one move, we realized Heraldic was in a class all by himself. There was something about the smooth, highly coordinated way he engaged his muscles that inherently made him move faster, with less energy, than all the rest. Heraldic did not want to be anybodies pet. Life was good there-untamed, racing his siblings in the large pasture back at Asgard. I take great pride developing a good man-horse bonding with the horses I develop. I want my horses to feel good about working with me. Heraldic is Heraldic. I am just lucky he enjoys doing some of the same things I do. I have never seen a horse with such self identity, and reliance only on himself. Heraldic needs no one, man or beast. Heraldic trusts no one, he can look out for himself. He seldom more than lifts his head when his pasture mate is taken out, and never has particularly bonded with another horse. On exercise runs, he works alone as aggressively as with company, although he does take considerable pleasure in showing the hairless side of his tail to other horses. It is obvious that Heraldic wants to be known for his physical gifts, and only for them. The image he projects to other horses is little different than the face he shows me. When turned out with a group of horses, he will never allow himself to be beaten in a challenge run, and yet seems completely uninterested in marking his status in the herd. He doesn’t care to be an alpha, and yet won’t tolerate being pushed around. He is just there of his own identity. He works well in the group, but has no dependency on it. Heraldic is Heraldic. His coat of arms is the flare of his nostril, a piercing eye, and a cloud of dust. Catching Heraldic is a fine art, and it’s not that he is against going out to work, he actually likes that part. Any excuse to run around a while and show independence is a good one. If you want him to run a long while, that is no problem. “How about 200 miles right here in this pasture?” Heraldic seems to offer. Trying to access natural horse instincts and hook him up is like pulling in a whale with kite string. This horse could be all alone in the wilderness and quite content. All the other horses here, other Asgards as well, are conditioned to come running across the pasture to me as soon as I call. Heraldic has taught me a lot about catching loose horses, what works a little on him, charms others. I’m going to go put a halter on some white-tail deer next. Heraldic is naturally sensitive to aids. So sensitive that it has been a challenge to teach him to relax and to forgive an occasional imperfection of contact, such as will happen when you are running in a group over rough terrain. This has been the only real challenge in developing him to be an endurance horse. His physical conditioning and every other aspect of his maturation has bloomed with gifted ease. Heraldic knows the task at hand like he was somehow pre-wired for exactly one purpose, endurance racing. It has taken a little extra time to convince him that there was any need for me to come along. He has the program and is quite confident he could do this all on his own. Of course no hot-blooded horses inherently rate themselves properly at the start of a race. When free horses race, the game is won for who ever is in front when all others throw in the towel, an indefinite distance race. Doing very arduous 100 milers like the Old Dominion and the Tevis most quickly develops a horse’s sense that there is a purpose behind being rated. The fact that these courses run overland without at lot of looping back creates a keen awareness that there is a certain distance to be done, a place to get to. Sometimes people are surprised that I bring some fairly inexperienced horses to these tough rides. I never shortcut on long and careful physical development before a horse does any race. Taking a new horse to one tough race, develops more maturity and wisdom than you will achieve running a dozen fast courses. The stalwart competitor we all strive for is created with less risk and less wear all in all. The greatest reward of all from this grand racing season is knowing that I have a much better working companion now than when the year started. He is also quite physically undaunted from the season, more fit and fresh than ever. Heraldic is even adding just a little bit of a healthy social exchange to his character. Just the other day was a milestone, I got a little bit of a pleasure reaction out of him while grooming. I’m sure I have done things that felt good before, I’ve certainly tried, but he is only now allowing himself to show it. At this rate, in another 20 years even Heraldic will let himself be a pet. I am certain that if the world changed overnight and there were suddenly no more organized endurance rides I would still be doing this, and challenging myself just as hard, even if all alone. Heraldic makes it clear that there are horses of the same mind. Arriving into the northern California town of Mendocino in a bright red Smart car is a little like landing in a miniaturised Tardis, such is the curiosity it garners. "What is that thing, a rollerskate?" one local chuckles, while a weathered, ratty-haired woman dressed in a felt coat, ugg boots and a red sequinned scarf circles my rental vehicle whispering, "Whooooaaaa! ", clearly having some sort of acid flashback. Born in the logging heyday of the 1860s but peaking in the 1960s when it was rediscovered by Bohemian artists, Mendocino, three hours' drive north of San Francisco, is a town frozen in time. With pastel chocolate-box houses and wooden water towers, this quaint village perched on a peninsula overlooking the wild, woolly Pacific Ocean is seemingly uprooted from east coast Maine, impossibly endearing and as pretty as a Hollywood set. It seems fitting, then, in this outpost of fewer than 1000 permanent residents, that I am temporarily trading in the Smart car for a more timeless form of transport - the four-legged variety. I have been lured here by the reputation of Ricochet Ridge Ranch, widely considered among the equestrian community as one of the premier trek operators in the world, as well as by the promise of riding both on the beach and through the redwood forests that are so symbolic of this region. With the afternoon sun victorious after a squally start to the day, it's the former attraction that Ricochet's owner, Lari Shea, is anxious for me to experience first. "Quick, let's get you to the beach while this weather lasts," Lari, distinctively clad in red western shirt and cowboy hat, says as she greets me in the lobby of the Mendocino Hotel, my accommodation for the next few nights. Did shorter route, no High Sierra riding, tarnish Tevis? The 56th Tevis Cup ride was like no other, with early autumn snow keeping the endurance event’s equestrian teams out of the High Sierra and shortening the usual 100 miles of hard riding. But that didn’t dampen the enthusiasm of rookie rider – and new Tevis Cup buckle recipient – Charles Cowan of Yacolt, Wash. for this year’s event. Cowan picked up his prized Tevis – “100 miles in 24 hours” – buckle at the awards ceremony in Auburn on Sunday. He was one of 123 finishers from a starting field of 176. “I’ve never been to an endurance ride so well-organized, particularly in relation to what happened,” Cowan said. This year’s ride was in danger of being shut down by snow not once but twice. 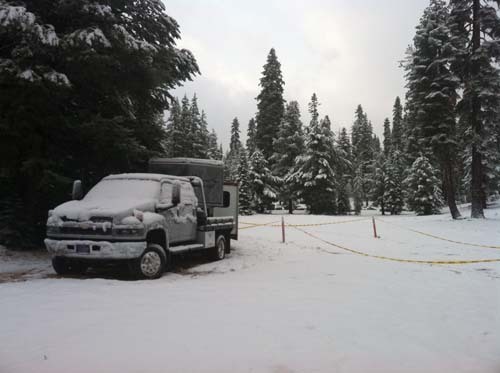 In June, Tevis organizers decided snow depths were too heavy in the Sierra to allow the ride July 16 and it was postponed until Oct. 8. Then a freak, early snowstorm – the earliest in recent memory – dumped 22 inches of snow at the start line. The Western States Trail Foundation board decided Thursday to remap the Tevis route so that the ride could go on this year at lower, snow-free elevations. The postponement came three years after heavy smoke and the threat of wildland fire cancelled both the Tevis ride and Western States 100 endurance run from high in the Sierra to Auburn. Kathie Perry, president of the Western States Trail Foundation and 21-time Tevis finisher, said Monday that riders were given the option of pulling out after the route was changed Thursday and getting their fee refunded. On Friday, the number of riders was down to 187 from 198 and by start time, 176 were at the Gold Country Fairgrounds. The race started and finished in Auburn for the first time. Normally the riders would start out from Robie Park in Truckee on Saturday morning in August or July. The postponed ride was to start at Truckee. Perry said the board could have chosen to cancel the ride. But with cooperation from the state Parks Department, the U.S. Department of Forestry and the CHP, clearances were given to reroute the Tevis to start in Auburn, travel out to a point 38 miles east near Michigan Bluff and then double back on the trail to Auburn’s Gold Country Fairgrounds and the traditional finish line at McCann Stadium. “What I’ve heard is people loved it because we put a ride on for them,” Perry said. Rain and cooler temperatures which would have put a damper on the ride, were back by Monday. “We got some luck and a window of good weather on our side,” Perry said. Perry said that the shorter distance – about 89 to 91 miles instead of the usual 100.1-mile route – didn’t tarnish the luster of an event with an international reputation among riders for its tough conditions. About half of the Tevis horse-rider teams usually finish and earn buckles. This time around, the buckle percentage was up to 70 percent. Greenwood’s Potato Richardson, a 21-time Tevis finisher, was one of the riders who ended up without a finisher’s buckle. Richardson’s Arabian mare completed the route but was pulled at the McCann Stadium veterinary check. Richardson said he felt there was “plenty of horse left” and that he’ll be advocating a rules revamp for more clarity on defining horse health. Richardson said he knows at least a couple of riders who pulled out because the Tevis ride this years wasn’t the same traditional route. That group of returnees is likely to include Washington state’s Cowan, who said he’s already looking ahead to Tevis in 2012 – and climbing Cougar Rock. “The ride itself was just magnificent,” Cowan said. Tevis Start Location Changed to Auburn Fairgrounds! NEW START TIME AND LOCATION FOR THE TEVIS CUP: Due to the excessive snowfall in the high country and at the usual starting line of Robie Park on Wednesday and Wednesday night, the 2011 Tevis Cup will start and finish at the Gold Country Fairgrounds in Auburn. The start will be at 6:30am Saturday 10/8 and go up to Foresthill. Rider Check-In begins at noon at the Fairgrounds on Friday 10/7. More details coming soon at http://www.teviscup.org/. photo: Wendell T. Robie bought his first horse, a mustang from Nevada, for $20 of his own savings. With a little help from his grandfather, he broke, then rode, the horse all over Auburn to do errands for his father. He was 7 years old at the time. Previously in this column, we shared the tale of the Pullman railcar at the Historic Passenger depot complex. Immediately, requests were voiced for the story of Wendell Towle Robie, in whose honor the US Bank gave the rolling hunk of metal to the Colfax community. This is, albeit brief, a summary of the man and his legacy to the Sierra. A native of the Placer County seat, Auburn, born May 28, 1895, his ancestry dates back to New England colonists originating from Derbyshire, England. Henry Robie came to America and is a charter signer for the new town of Exeter, N.H. on July 4, 1639. Wendell Robie’s great-grandfather, Bracket Towle, was an officer in the Revolutionary War. Robie’s grandmother was the younger sister of the three Towle brothers who answered the call to the gold fields of California in the early 1850s. Ethan Allen Towle, the first to head west, reached Dutch Flat in 1851. He quickly realized there was a better fortune to be made in supplying the miners. Having had a lumber operation in Vermont, he knew the formula for success. He convinced his two brothers – George Washington Towle and Edwin Warrington Towle – to join him. After his sister May married John Henry Robie and had their child, Edwin Towle Robie, Towle invited them to move west and join the operation in 1870. By 1889 their company became one of the largest lumber operations in California. In 1887, J.H. Robie moved his family to Auburn in order to take charge of the Towle Bros. lumberyard. The primary reason for the transfer was to allow his son, E. T. Robie, to attend Sierra Normal College. He majored in business accounting and graduated in 1888. It was there “E.T.” met and later married Ina Stone in 1894. Shortly thereafter their first child, Wendell, was born. When E.T. Robie became secretary of the Towle Brothers Company, he moved back to Towle. That’s where Wendell T. Robie began his schooling. The town was near Baxter and Alta but was subsequently removed for the construction of Interstate 80. In 1900, George W. Towle, the only surviving brother, sold the sawmill business and retired. J.H. Robie, E.T. Robie and Lathrop Huntley purchased the Towle firm in Auburn and renamed it the Auburn Lumber Company. E.T. was named president. Under his direction, he and his associates expanded operations to Colfax, Truckee, Dixon, Woodland, and Tucson, Ariz. In 1901, the company obtained a charter for a savings and loan association; it was the forerunner of Central Bank of California and Central California Building and Loan. Years later, the Robie firm was to become Heart Federal Savings. In this rich environment and family history, Wendell T. Robie grew into self-confidence. He became president of the 1912 Placer High School graduating class. The assumption that he would follow the family tradition of taking over the business was a given. First college was on the menu. However, he was more interested in being a prankster than studying. The result was a failed attempt at the University of California, Berkeley almost ending in expulsion. Money and influence prevailed and after a short intermission and a bit of maturation, Robie transferred to the University of Arizona. While at Arizona, Robie began his lifelong practice of getting involved in community. He also met and married his life companion, Inez Benzie. They had one son, John Henry. The continued success of the family business through the years allowed him to pursue his avocations with vigor. The list of his dedications is long. It ranges from president of the Placer High Alumni Association to Lions Club, Auburn Volunteer Fire Department, Native Sons of the Golden West and E Clampus Vitus. Not just a joiner, he was a visionary and a doer. He formed ski clubs, along with other sporting groups. He was politically minded as well serving on several commissions and committees, often as chairman. Robie was a major player in not only bringing the Winter Olympics to Squaw but also seeing that Interstate 80 was completed to get spectators to the event. One would be hard pressed to find disagreement that his greatest contribution, through vision and tenacity, is the construction and preservation of the Western States Trail. As founder of the WST Foundation in 1955 and the ride commonly called the Tevis Cup, Robie offered to the entire world his dream of a continuous trail, through the high summit at Squaw Pass and traversing the best scenic areas and maintain an absolute wilderness character. The 100-mile trail starts at Lake Tahoe, runs down the Foresthill Divide and ends in Auburn. The 56-year-old horse endurance contest and its younger two-legged runner version – the Western 100 – are internationally famous. The foundation protects and maintains the trail to this day. Wendell Towle Robie literally worked until the day he died, October 31, 1984, at 89 years. He was wearing his Lions Club vest. The first winter snowfall brought 8 inches of snow to the Sierra Nevada mountains around Robie Park and Squaw Valley through which the 56th annual Tevis Cup traverses. Starting time for the ride is scheduled for 5:15 AM Saturday October 8th. The chance of snow drops to 40% today at Robie with a predicted high of 41*. Overnight temperature will be 23*; Friday calls for mostly sunny with a high of 53*, and ride day sunny and 64*. A message from the Ride Director on the Teviscup.org website says, "Ride management is aware of the cold front preceding this weekend's ride. We are working to ensure that the ride camp and trails are ready regardless. We are staying informed with weather updates and the weather will not stop the event." In December 2009, local CHP officer Kassandra Tucker was asked by the United States Equestrian Federation to host the North American Endurance Team Challenge in Indian Valley, after successfully hosting the 2009 American Endurance Ride Conference National Championship in the same location. After a year and a half of preparation, training and detail oriented planning by Kassandra Tucker and Greenville Rotary President Centella Tucker, the North American Endurance Team Challenge finally arrived. The event happened Sept. 24 in Greenville, and it was the last of three rides that were major fundraisers for the Greenville Rotary Club. The event was good for the local community, bringing hundreds of competitors and their crews to the community for as long as eight days. Base camp was located at the beautiful and spacious Coppercreek Camp. Although the competition did not start until Saturday, preparation for base camp began Sunday, Sept. 18, with local rancher Andy Meyers, who delivered corrals for competitors whose horses had left a week earlier and traveled across the United States to compete in this event. The first horses and competitors arrived the evening of Sept. 18. With a winter storm warning in effect, snow has begun to fall in Robie Park in the Sierra Nevadas - the starting line of Saturday's Tevis Cup. Wednesday's forecast for the Robie area is total daytime snow accumulation of 3-5 inches possible, with a west wind between 15 and 25 mph, gusting as high as 35 mph. Overnight the temperature will be around 27*F, with wind between 10-15 mph and new snow accumulation of less than one inch possible. By Thursday the chance of snow showers will decrease to 40%, with a daytime high of 36*. Friday should be mostly sunny and 50*F, while ride day, Saturday, should be sunny with a high of 58*F.
As of October 4, 190 horses and riders are pre-entered in the ride. When the Tevis Cup endurance competition kicks off at 5:15 a.m. on Oct. 8, more than 200 horse and rider teams will attempt to travel 100 miles from near Lake Tahoe, Calif., to Auburn, Calif., in 24 hours or less. Greg Fellers, DVM, veteran head veterinarian at the ride, will oversee a team of 16 additional American Endurance Ride Conference (AERC)-certified veterinarians to make sure the horses navigate the trek safely. 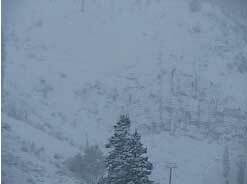 Traditionally held during July, heavy snowfall along the traditional route in California's High Sierra Mountains forced ride management to reschedule the event to October. Never before has the ride been held in the fall, and the date change brings both new concerns and potential advantages. "The weather could about 20 to 25 degrees cooler than a traditional Tevis date, and there could be a problem with a hot, hardworking horse coming into vet checks and standing," Fellers said. "It will certainly behoove both riders and vets to expedite the (vetting) process as quickly as possible." A four-time champion of the Iditarod Trail Sled Dog Race has a new kind of feather in his hat. Doug Swingley of Lincoln led the Mountain A team to the gold medal at the 2011 North American Endurance Team Challenge in the Cascade Mountains near Greenville, Calif., on Sept. 25. Swingley rode his horse Pal of Mine in the 100-mile U.S. Equestrian Federation event. He placed fourth overall in a time of 8 hours, 56 minutes after leading for 30 miles during the middle part of the race. Veteran rider Suzanne Hayes of Ovando and Suzanne Hedgecock of Park City, Utah, helped the Mountain team clinch the win. Teammate Christoph Scholk of Moab, Utah, was eliminated at the fourth gate. Swingley became the first non-Alaskan to win the Iditarod in 1995, and followed with consecutive wins in 1999, 2000 and 2001. He announced his retirement from long-distance sled racing in 2008. The book was published September 15th 2011 by Winter Goose Publishing and is available at Barnes N Noble and online. With less than 5 days left in the countdown, the first winter storm of the season in the Sierra Nevada range will add an element of intrigue to the 56th Tevis Cup, which is being held for the first time in October, after being postponed from its regular July date because of too much late snow on the trails. This is the official weather forecast by the National Weather Service for the Robie Park area (the Zero Milepost for the Tevis Cup). "HEAVIEST PRECIPITATION WILL FALL TUESDAY NIGHT INTO WEDNESDAY... WITH ACCUMULATING SNOWFALL IN THE HIGHER ELEVATIONS OF THE SIERRA. THOSE PLANNING TRAVEL OVER THE SIERRA THIS WEEK SHOULD PREPARE FOR WINTER CONDITIONS NOW TO AVOID BEING CAUGHT OFF GUARD BY THIS EARLY SEASON STORM. * WINDS: SOUTHWEST WINDS 20 TO 30 MPH WITH GUSTS UP TO 50 MPH. RIDGE GUSTS UP TO 90 MPH. Chance of snowfall will taper off Wednesday into Thursday, with temperatures rising. The expected high Friday is 51*F and Saturday 59*F with mostly sunny skies. This moisture from the snowfall should help to minimize the dust from the trail-bed from the hoof-beats of 206 horses. The following link is for the approximate latitude & longitude and elevation of Robie Park, so that it is slightly different from Truckee or Squaw Valley.